In the year during which Omakayas is twelve winters old, she and her family leave their home near Lake Superior and head west, looking for a new place to settle. As they make the difficult journey, Omakayas and her younger brother, Pinch, both begin to come of age, taking on new names and identities as adulthood comes ever closer. The year is marked by many emotional ups and downs, including the loss of a beloved family member and the revelation that another is perhaps not what he had first seemed. I was really annoyed by the representation of Father Baraga in the second book of this series, Game of Silence, and it took me a while to want to read another book for fear there would be more blatant inaccuracies requiring research and emails to Catholic Answers apologists. Happily, there are no egregiously anti-Catholic representations in this book, and indeed, priests, when mentioned, are shown to be helpful and merciful. 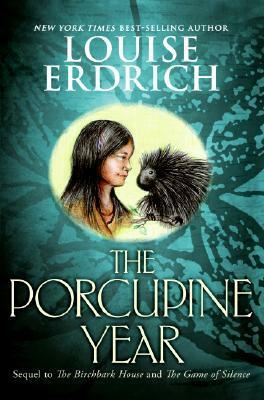 Without having to dissect scenes involving Catholic clergy, I was able to enjoy this novel for what it is: an exciting but emotional adventure story about Ojibwe life in 1852. There is a lot of memorable description in this book, and while not all of it is pleasant to read about, it is all handled very tastefully and almost poetically. Though there are some definite scary moments, and some that could even be considered gruesome, I did not find them so troubling that I lost sleep or had nightmares or anything like that. Even the scenes about Omakayas beginning her "moon" and gaining the ability to bear children were written in a way that didn't feel embarrassing or awkward. Erdrich describes this experience as such a positive and meaningful transition from girlhood to womanhood, and though it is very specific to Omakayas's culture, I think her description could be comforting to a girl from any time and place. While the plot in this book is pretty action-packed, for some reason, I just didn't connect with it as strongly as with the first book of the series. Still, I enjoyed the story and plan to read the next book, Chickadee, sometime this spring, at which point I'll need to get myself a copy of Makoons, the only one of the series I don't yet own, and the final book.